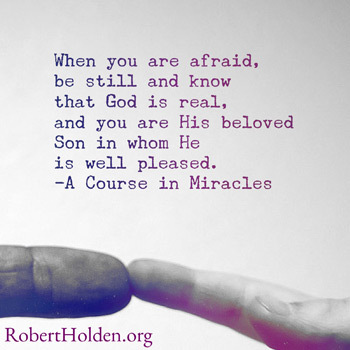 6 Simple Ways to Meet Fear with Love | Robert Holden, Ph.D. While it’s true that I still get afraid, it’s also true that I have a much better relationship to fear now. The way I now relate to fear has been influenced largely by my study of A Course in Miracles (ACIM), which offers a training in spiritual psychology. 1. Fear is a call for love. A Course in Miracles teaches that you only ever experience two things in life: love and a call for love. Examples of a call for love include fear, judgment, worry, shame, anger, grief and pain. The Course states, “attempting the mastery of fear is useless. In fact, it asserts the power of fear by the very assumption that it need be mastered. The true resolution rests entirely on mastery through love.” In other words, it’s love that heals fear, and therefore, it’s essential to meet fear with love. 2. Being with the fear. I once met a Buddhist monk, while travelling through Bodhgaya, who gave me the single most useful piece of advice about how to relate to fear. He told me, “When you are afraid, don’t say ‘I am afraid’; say instead, ‘I am with fear’.” Try it for yourself, right now. Think about a specific fear, repeat “I am afraid” five times, and notice how your body, your heart and your thoughts react. Next, think about the same specific fear, and repeat “I am with fear” five times, and notice how differently your body, heart and thoughts respond. When you say, “I am afraid” you are identified with fear. Your entire sense of self is scrunched up in the fear. All you can do is react to the fear. However, when you say, “I am with fear”, you are no longer defined by the fear. Being with the fear, rather than fighting it, re-framing it, judging it, shaming it, etc., invites a spirit of acceptance. With acceptance, a space appears in your mind and in this space you have “a magic quarter-second” in which love can work a miracle. When I’m afraid, I try to remind myself as soon as possible of this truth: the soul is never afraid. A Course in Miracles teaches that fear is produced by the ego, your separate sense of self. Fear is what you experience when you get caught up in what Einstein called the ”optical delusion” of separateness. That’s why you usually feel most alone when you’re afraid. Try for a moment to feel afraid and wholly connected to the universe. Try it for one minute. It’s impossible to feel the Oneness and feel afraid, isn’t it? The ego experiences a psychology of fear, and the soul lives in a consciousness of love. When I’m afraid, I take it as a sign that I have tuned out of my Soul mind, so to speak, and I’m now listening to Radio Ego inside my head. It’s time to re-attune myself. I do this by 1) being willing to meet fear with love; 2) saying “I am with fear” rather than “I am afraid”; and 3) remembering my true soul nature. “The need to recognize fear and face it without disguise is a crucial step in the undoing of the ego,” states the Course. I have two ACIM quotes that sit on my writing desk. The first one says, “The presence of fear is a sure sign that you are trusting in your own strength.” I often need to look at this quote! My ego’s default position is self-reliance. When I take self-reliance too far I try to do life all by myself, without any help from others. This old habit fences me off from people and from Heaven’s help. “When you are trusting in your own strength, you have every reason to be apprehensive, anxious and fearful,” states the Course. The second ACIM quote that sits on my desk is, “If you knew Who walks beside you on the way that you have chosen, fear would be impossible.” These words are deeply comforting and inspiring to me. They remind me to share my fears with God, with the Christ, with my angels, and my spiritual support team. And, also, most importantly, with Hollie, my friends, and other people in physical bodies! When you share a fear, miracles happen, and the first miracle is that the fear immediately feels more manageable somehow. 5. Healing is a release from fear. When I’m afraid, anxious, depressed, lonely, I notice (eventually) that these feelings have little to do with the present moment and with reality. When I meet my fears with love, I see that they are mostly theoretical fears. For example, the fears I experience before I give a public talk aren’t about what is actually happening; they’re about what might happen. “Look at what you are afraid of. Only the anticipation will frighten you,” says the Course. Meeting fear with love helps us to let go of stories and experience reality. Either my fears are about the future; or they are echoes from a past experience. Perhaps I am afraid of something because of an old wound, a past disappointment or an unhappy memory, for instance. Imagine if you hadn’t had a past (no stories) and then try to be afraid of something! It’s impossible, isn’t it? When I’m afraid, I look for something from my past to forgive – a relationship, a failure, a trauma or a mistake. “All healing is essentially the release from fear,” teaches the Course, and I know of no greater healer than forgiveness. 6. Love has the answer. Fear has a purpose, and the purpose of fear is to get our attention, rather like a fire alarm. Once a fire alarm is activated, it has no other purpose. Fire alarms can’t put out fires. Keeping a fire alarm on after you’ve heard it doesn’t make things better. Turning the volume up on the fire alarm doesn’t help either. Similarly, fear makes you alert; but it isn’t the solution. “Do not think that fear is the escape from fear,” teaches the Course. Some people say we need fear. They say, for example, “I’d burn my hand on a flame if I didn’t register fear.” Or, “I’d get killed if I wasn’t afraid crossing a road.” Fear can keep you safe; but so too can love. I believe, with all my heart, that love is intelligent. I wrote a book about this called Loveability. Love is your original mind, without any neurosis. Love is wise, and love will keep you safe if you listen to it. Thus, when you’re afraid, the key is to let love guide you, bless you and inspire you. Love has the answer.